Visualize your data in a handy hierarchical structure. dhtmlxDiagram allows you to export your chart/diagram to PDF or PNG using our online export service or getting your own export module. There's a simple and intuitive way to change diagram appearance without coding in the edit mode. There're two types of editors available: for org charts and for other diagrams such as flowcharts, activity, block, tree diagrams etc. Editors let you add, delete and customize all components on the fly. The diagram component consists of nodes and connectors. You can use both textual nodes and nodes with an image. There are more than 30 shapes of nodes for building any diagram type you need: circle, rectangle, process, start, end shapes and many others. Creation of a unique style for your diagram will be easy. The look and behaviour are fully customizable, so you can set up any appearance you need via CSS or object properties. There is a vertical mode of data representation. It can be use to show wide organization structure in a compact way. Check the sample. You can easily integrate this html5 diagram library in any web app. It supports the data loading in the JSON format, and can be used with any server-side back-end. Creating diagrams and org charts may take you just a few moments in the editor mode. We've introduced two types of editors: diagram and org chart editors. Embed the editor in your app to let your users live edit the diagram on their own. Diagram editor for such diagram types: as flowcharts, decision trees, block diagrams etc. dhtmlxDiagram library includes various nodes and connectors for building diagrams according to your goals. Here are some examples of the most popular diagram types that you can create with dhtmlxDiagram component. You can apply a decision tree diagram in numerous ways not only for decision-making, but also for achieving any other goals of the company. For example, a vertical decision tree can be used to show your application's functionality or steps of any work process. Our component permits creation of a complex diagram structure in a wide but neat flowchart. If you'd like to take a detailed look into how users interact with your website or dive deep into any other process steps, this type of diagram will suit you the best. 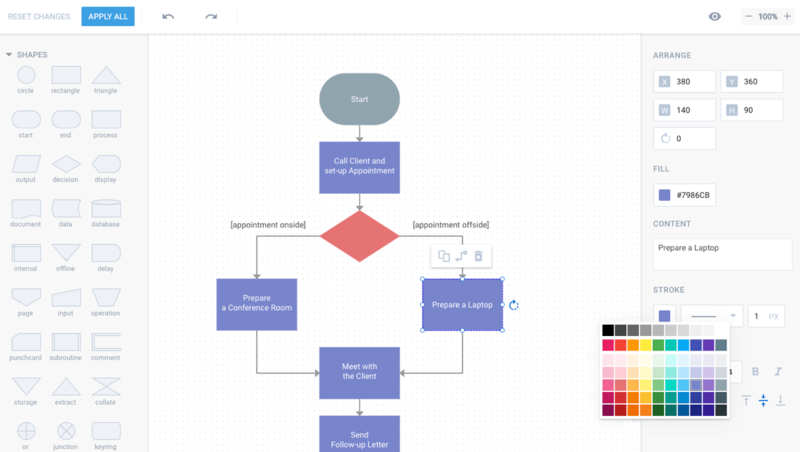 Modeling your business process is simple with activity diagrams. You can easily put all your activities into one coherent scheme, which will serve as a handy and illustrative tool in order to meet your organization's needs. One of the most convenient ways to find the right solution for the company is to compare different options graphically by means of decision tree diagrams. A tree-structure of the diagram helps you to reflect your business decisions together with the expenses and draw conclusions. If you need to have an overview of some process or system, you can take advantage of block diagrams providing a broad look at an issue in question. Escaping too many details this type of diagram is very helpful in describing processes at large. One of the most widespread diagram types is organizational chart used to depict the structure and hierarchy of an organization. 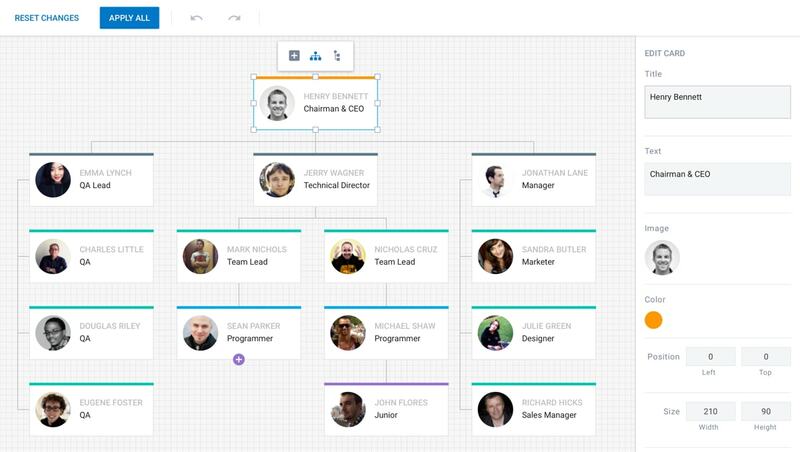 Our org charts support lots of useful functions like embedding pictures or hiding cards of your choice. DHX Diagram js library works seamlessly in all modern web browser: Google Chrome, Firefox, Internet Explorer, MS Edge, Safari. The component is very lightweight that provides fast rendering and high performance with any amount of nodes and connectors.